The University of Houston Libraries will host a workshop for academic librarians on Friday, May 18. The free, day-long workshop is part of Digging Deeper, Reaching Further: Libraries Empowering Users to Mine the HathiTrust Digital Library Resources, an initiative of the HathiTrust Research Center. The workshop’s “train-the-trainer” curriculum was developed to help academic librarians support the evolving digital scholarship needs of students, faculty, and researchers. 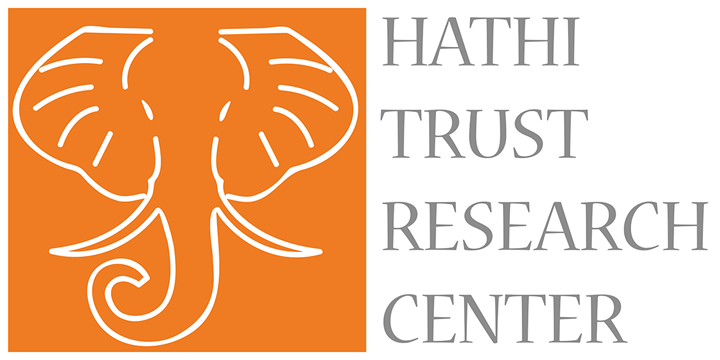 The May 18 workshop, to be held at the University of Houston MD Anderson Library’s Digital Research Commons, will introduce participants to text mining with particular attention to the tools and data of the HathiTrust Research Center. The three-year project is funded by a Laura Bush 21st Century Librarian grant award from the Institute of Museum and Library Services (IMLS). A new incentive program at the University of Houston will award UH faculty members who adopt, adapt, or create an open or alternative textbook in their courses. Instructors of record for a Summer 2018, Fall 2018 or Spring 2019 course are encouraged to apply to the UH Alternative Textbook Incentive Program by April 15, 2018. Awards of between $500 and $2500 will be made based on overall feasibility of the proposal and the estimated financial impact for students. In partnership with the Office of the Provost, the UH Open Educational Resources Committee has implemented the UH Alternative Textbook Incentive Program as part of the University’s initiative to improve students’ academic experience by mitigating the high cost of textbooks. A 2015 NBC News review of Bureau of Labor Statistics (BLS) data shows that textbook prices have risen over three times the rate of inflation from January 1977 to June 2015, a 1,041 percent increase. Open educational resources (OER) offer an alternative to the problem of expensive textbooks for students. According to a recent survey conducted by the UH Student Government Association, over 37% of respondents have not purchased a required textbook due to the cost. 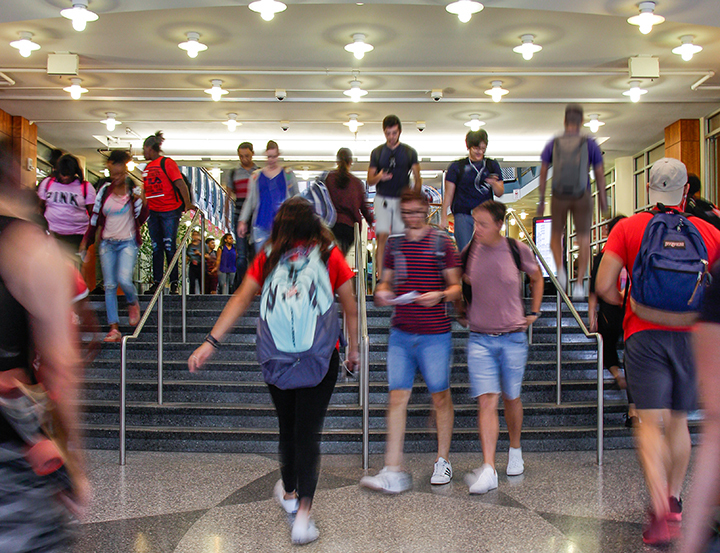 By shifting to freely accessible and openly licensed teaching, research, and learning tools, including textbooks, more students will have access to course materials. University of Houston Libraries will host an open forum for faculty to learn about the benefits of alternative textbooks and how to get started in offering an alternative textbook. Mimi Lee, professor, College of Education, and Jason Eriksen, associate professor, College of Pharmacy, will discuss implementing open textbooks in the classroom and the support provided through the incentive program on April 3, from 3:00 – 4:00 p.m. in the MD Anderson Library, 10F (basement level). Contact oer@uh.edu for more information. UH Libraries welcomes Emma Fontenot as the new social sciences librarian. The University of Houston Libraries welcomes Emma Fontenot as the new social sciences librarian. I’ll be working with students and faculty in communications, sociology, political science, and economics to provide research, instructional, and collection development support. I am also a member of the Liaison Services Research Services Team which provides support for things such as data visualization, digital scholarship projects, statistical analysis programs like SPSS, and more. I am especially excited about working with students and showing them all the resources UH Libraries has to offer. My background is in political science—political theory to be precise. It heavily influences my research interests as a librarian as my work tends to blend political theory with library and information science. My background has also shaped my perception of librarianship. I see it as an inherently political profession. Our goal is to freely and objectively disseminate information, which in turn allows people to make informed decisions. Knowing that I am helping students develop the skills that will allow them to formulate well-founded opinions is extremely rewarding. I love UH! It’s an extremely vibrant campus. Whether it is students playing music or hosting high profile events, there always seems to be something interesting going on. I also love the diversity on campus. Coming from a fairly small city, I find it refreshing to see people from all walks of life on a daily basis. And I couldn’t ask for more supportive colleagues. Everyone has been extremely welcoming and encouraging. I love to travel. Two summers ago, my political science graduate advisor invited me to join his study abroad class for a month in London. Ever since then I haven’t stopped traveling. A couple of weeks after returning from the UK I somehow convinced my husband to drive us from Jackson, MS to Vancouver, BC and back around through California. It was amazing. We covered 7,500 miles in 12 days camping out wherever we could. And last summer I went on a solo backpacking trip to Europe. It’s now my ultimate goal in life to travel full-time. 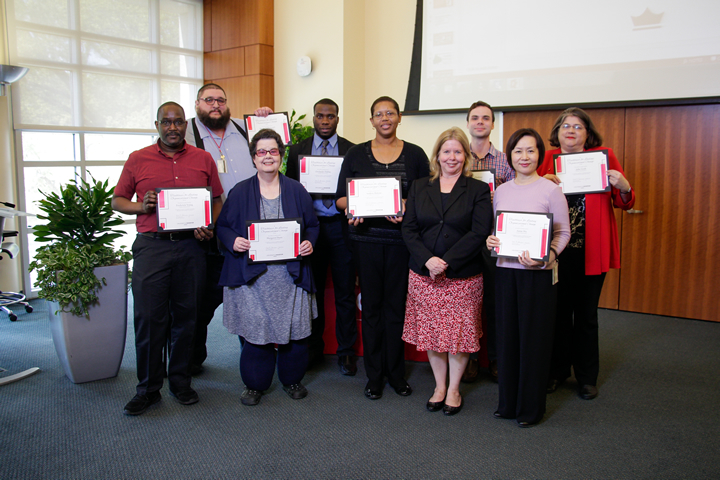 University of Houston Libraries honored outstanding librarians and staff at an awards ceremony this month, held at the MD Anderson Library Elizabeth D. Rockwell Pavilion. Dean of Libraries Lisa German commended not only this year’s award recipients but all Libraries staff for their exemplary service, collaboration, and dedication to the mission of the Libraries. The Dean’s Library Advocate Award was presented to Bill Allen, building management systems lead with UH Facilities. This award recognizes a University of Houston employee who has worked closely with the Libraries during the past year, and who has made a significant contribution to the success of the Libraries. Allen was part of the UH ride-out team that maintained critical infrastructure during Hurricane Harvey. He played a tremendous role in keeping the Libraries operational in the days following the disaster. The Committee on Diversity and Inclusion (CODI) received the Trailblazer Award for Leading Organization Change. Lisa Cruces, Orolando Duffus, Margaret Dunn, Julie Grob, Andrea Malone (chair), Matthew Moore, Shawn Vaillancourt, Annie Wu, and Frederick Young have begun to lay the groundwork for new initiatives that will continue to improve the Libraries. Despite being newly formed, their work has already resulted in positive organizational changes. The John P. McGovern Librarian Rookie of the Year Award winner is Taylor Davis-Van Atta, who, in a short time frame, has made significant contributions in a short time frame. He has been instrumental in bringing UH Libraries up to current digital scholarship standards with his work on Cougar ROAR and open access initiatives. His talent, creativity, and commitment have contributed to a multitude of projects, including improving workflows for the ingestion of data into the Cougar ROAR repositories, promoting Cougar ROAR to students and faculty and developing campus partnerships to showcase university scholarship along the way, and serving on the UH Libraries Copyright Team and the Faculty Senate Graduate and Professional Studies Committee. Shanequea White is the McGovern Staff Rookie of the Year. White is the go-to for anything HR-related and is very well informed on UH campus life. Her zeal for excellence and efficiency has led her to innovate a workflow that streamlines the hiring process for student workers in the Libraries. Furthermore, she is active on the UH campus and in surrounding Houston communities. She serves as the Libraries Representative on the University of Houston Staff Council and as ex-officio for the newly established Library Staff Advisory Group. In fall, 2017, she Co-Chaired the Staff Council’s Events Committee and led the Sock and Blanket Drive that benefited Star of Hope Mission and Harris County Protective Services Guardianship Program. The Student Achievement Award recipients are Rene Andrade (Research Materials Procurement) and Katherine DeYoung (Music Library). Andrade’s supervisor describes him as a person that “does all of this work with a smile,” but it is his leadership abilities that set him apart. DeYoung’s supervisor writes that her “natural ability to encourage and support others has earned her the unofficial title of Cruise Director.” She serves as team lead on multiple projects, and it is her leadership and desire to enhance the experiences of others that set her apart. The McGovern Outstanding Student Award went to Diana Iraheta. She has been an invaluable part of Special Collections’ instruction support team since January 2017. She is dependable, trustworthy, and very attentive to detail. Iraheta is the go-to who gets the job done. Jamie Duke was honored with the Staff Achievement Award for her attention to detail and can-do attitude. She is an outstanding representative of the Libraries with new and prospective employees. She serves on multiple search committees, coordinates all logistics for campus interviews. Her consistent outstanding performance, positive service attitude, and team player persona have made her an asset to the UH Libraries. Sean Watkins received the Staff Achievement Award for being “one of the most talented developers working in academic libraries in the state if not the country.” He is a key member of the DAMS Implementation Team whose technical knowledge and abilities drives the development of the project. He has developed and deployed several products that have standardized and automated digitization, processing, and preservation workflows. He has presented work at multiple conferences. He recently developed and implemented an audio/video repository that has made over 500 videos from Libraries’ collections available online. The Librarian Achievement Award recipients are Daniel Pshock and Melody Condron. Pshock has made major contributions to improving the Libraries’ online user experience. He conducted needs-assessment interviews with finding aid users in preparation for the development of ArchivesSpace, and he has conducted System Usability Scale evaluations to measure the perceived usability of the website according to users. He served as team lead for a Strategic Plan project, Graduate Student Online User Experience. He also contributed to the Strategic Plan project for website accessibility, which has resulted in a dramatic improvement in access for people with physical, sensory, or cognitive disabilities. Additionally, his content analysis of the Libraries’ website paved the way for the migration to the new web design and content management system. Condron has made significant contributions to both UH Libraries and the library profession. She has played key roles in authoring new policies and implementing changes related to electronic workflows, retention and replacement of print materials, reassignment of library spaces for new student-centered and exhibit use, and the acquisition of print resources via the new DDA service. She has actively worked with cross-departmental teams to create new workflows in the wake of the restructure of the Acquisitions unit. She has worked to advance UH Libraries’ strategic goals pertaining to the quality and relevance of collections as a member of various teams. Furthermore, she has published one book and is currently at work on two more. Her service to UH Libraries includes chairing the UH Librarians and Identifying Recognition Opportunities Committee. She also successfully completed the competitive Cougar Chairs Leadership Academy. Additionally, she serves on multiple committees at the national level and is a vocal advocate for under-served communities. Susan Houston is the recipient of the McGovern Outstanding Staff Award. As chair of the Safety Committee, she has the safety of employees and patrons in mind. She promotes CPR/First Aid and other training for employees and manages emergency communications, ensuring that all employees are kept abreast of safety concerns and emergency situations. She also coordinates the implementation of various facilities needs throughout the building, including upgrading furnishings. She also coordinates the improvement of spaces. Houston demonstrated a commitment and drive that UH Libraries relied profoundly upon in the aftermath of Hurricane Harvey. In addition to handling day-to-day facility requirements, she ensured that renovation and repairs progressed at an acceptable pace, communicated this progress with library staff, and addressed interim needs while spaces were out of commission. UH Libraries could not have come through the devastation of Harvey without her. Mea Warren received the McGovern Outstanding Librarian Award. Warren has a demonstrated record of stepping up and is especially committed to leading and supporting student success initiatives at UH Libraries. She played a crucial role on the Campus Engagement Committee in the execution of Cougar First Impressions and Paws & Relax in the fall. She led the LinkedIn at the Library event last month while simultaneously helping the Faculty-Staff Campaign Committee to prepare a successful kickoff to the Hyped Up 2 Give campaign. Within her department, she contributes to the teaching team that serves two library instruction sessions each to a whopping fifteen sections of engineering writing every fall semester. She also devotes hours of recording time to a number of online information literacy modules for use in classes across all disciplines on campus. As a member of the Outreach Team, she provides on-demand research help to student athletes at the Alumni Center. She has also served as a “buddy” to help onboard new librarians to the department. 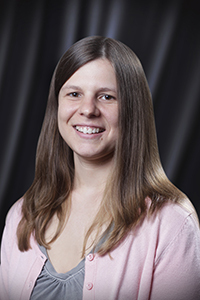 She is a member of the Association of College and Research Libraries (ACRL) Emerging Leaders Program and is an active member of several organizations related to her liaison areas. She has two publications for 2018. She is an outspoken advocate for under-served populations and presented on the experiences of librarians of color at the 2018 Association of Research Libraries (ARL) Leadership Symposium. The 2018 Staff Awards committee members are Orolando Duffus (chair), Erica Lopez (vice-chair), Mark Cooper, Jamie Duke, Diana Dulek, Xiping Liu, Matthew Moore, Daniel Pshock, Mary Rico, and Christina Gola (ex officio). View photos from the 2018 Library Staff Awards. 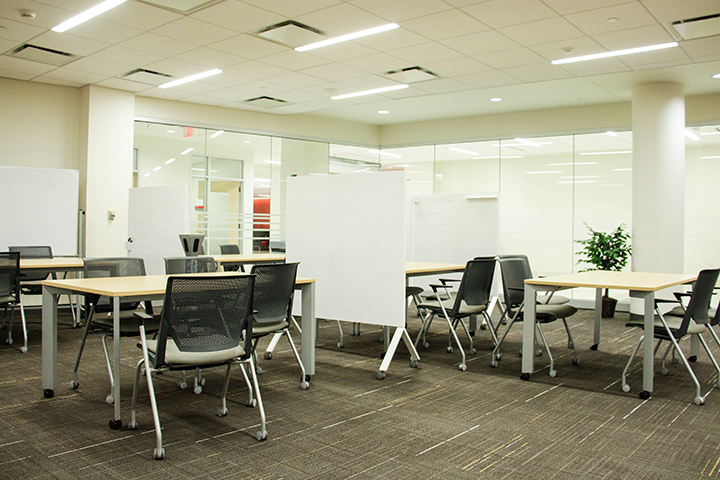 A total of 154 carrels have been rebuilt in the MD Anderson Library Brown wing, floors 2-5, and are open for study. After sustaining Hurricane Harvey damage, the carrels were demolished and now have new carpet, walls, and chairs. 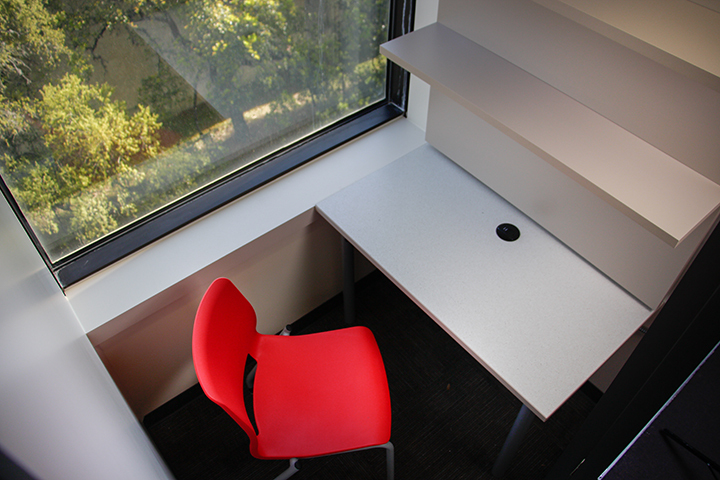 Revitalized study carrels are now open in the MD Anderson Library. View photos of the revitalized study carrels. The University of Houston Libraries Digital Research Commons will host a reading group discussion and workshop. A reading group discussion on failure will be held Friday, March 23 at 1:00 p.m. Failure is an integral part of academic work, and most of us learn to deal with it in one way or another in our disciplinary training. But failure and its sister experiences – frustration, delay, revision, rewriting – take on new forms in digital research in part because new methods succeed or fail in new ways. So how can we understand failure as a part of the process of digital research? Reading group attendees should read Stephen Ramsay’s seminal article, “The Hermeneutics of Screwing Around” (PDF). Attendees are welcome to bring a brown bag lunch for the discussion on how to make failure useful. A workshop on topic modeling will be held Monday, March 26 at 2:00 p.m. Topic modeling is one of the most talked-about digital research methods to have come to prominence in the past few years, and can be an incredibly powerful tool for understanding and making arguments about any large set of texts. In this 90 minute hands-on workshop, DRC director Claude Willan will explain the concepts behind topic modeling and then walk participants through two tools to do their own modeling. Please bring a laptop. Please also download the following programs in order to be able to do topic modeling of your own; there is no viable online portal for topic modeling, so you’ll need to download programs to do it on your own machine. Next, please download R from https://cran.r-project.org/ and R Studio Desktop — a graphic interface for R — from https://www.rstudio.com/products/rstudio/download/#download. All of these components are free to use. 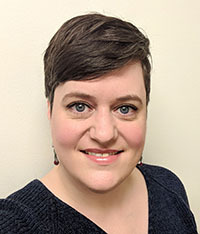 Rachel Helbing, interim director of library services for the health sciences at the University of Houston Libraries, has been named a 2018-2019 Rising Star from the Medical Library Association (MLA). The MLA Rising Star program gives members the opportunity to develop skills, knowledge, and personal characteristics to become a leader in the organization. Each Rising Star is paired with a mentor in a curriculum that includes monthly classes, opportunities to learn about the organization’s structure and history, and individualized projects. Helbing, MLIS, MS, AHIP, completed her Master of Library and Information Science and Master of Science in Health Informatics degrees at Kent State University in Ohio. She has been a librarian for over a decade and has worked in consumer health, hospital, and academic health sciences libraries. Her interests are in health informatics and evidence-based practice. 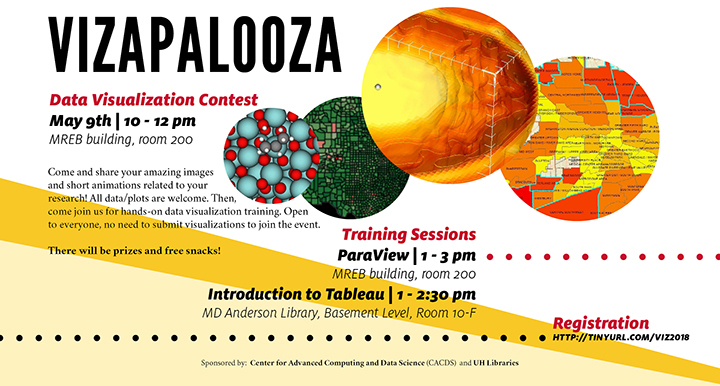 The UH Center for Advanced Computing and Data Science (CACDS) and UH Libraries will co-sponsor the 2018 Vizapalooza event to be held on May 9. A data visualization contest will be held in the morning. DEADLINE EXTENDED: Entries for the contest can be sent ahead of time to CACDS and should be received by May 4. Selected presenters will show and tell their visualization in MREB room 200 from 10am to 12pm. Two winners will receive tablets. Attendees can choose to attend one of two data visualization tool workshops for the afternoon. It is not necessary to submit visualizations in order to attend any of the Vizapalooza sessions, including the morning contest. The new Health Sciences Library at the University of Houston, located on the second floor of the Health 2 building, serves the teaching and research needs of the UH colleges of Nursing, Optometry, and Pharmacy, as well as other health-related programs on campus. The library holds a small physical collection of books and anatomy models. The space includes four group study rooms, 12 computers for use by library patrons, a conference room, a classroom, a reading room, and areas for study with tables and soft seating. Programming that supports inter-professional education and collaboration among all UH health programs is also being developed. 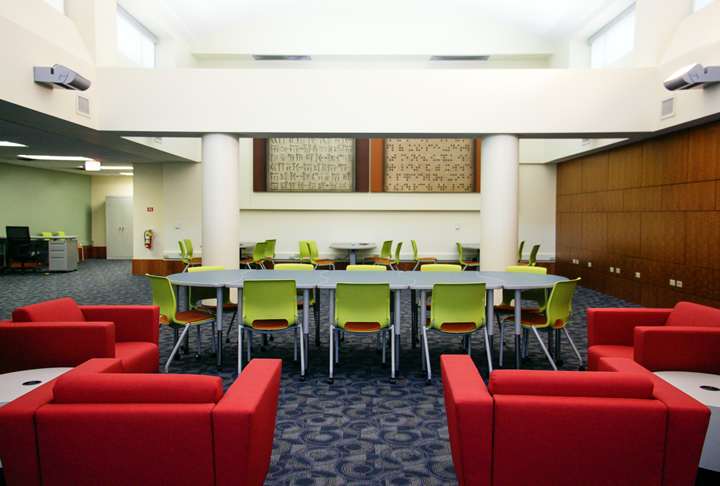 View photos of the UH Health Sciences Library. 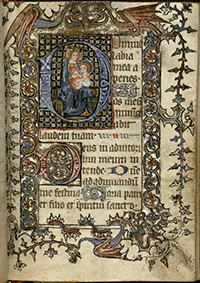 The University of Houston Libraries Special Collections currently preserves more than 106,000 rare books, ranging from medieval manuscripts to contemporary artists’ books, as well as over 2,000 periodicals. The Rare Books Collections focus on rare Bibles, British and American literature, Houston and Texas history, Hispanic literature and history, LGBT literature and history, as well as fine press books. Collections like these are built largely on gifts from individuals, whether they be single books, treasured collections built over years, or endowments intended to build and expand collections. Books are accepted into Special Collections based on their rarity, significance for research, and condition. To learn more about donating to the Rare Books Collections in Special Collections, please contact curator Julie Grob at 713.743.9744.